A wacky, absurd and lyrical presentation on that most hilarious of subjects: mathematics! After an overseas success (over 500 performances and counting!) 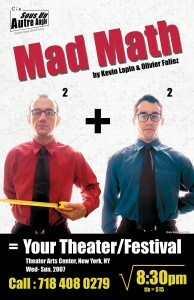 in schools, theaters, festivals and even several closets across France, Mad Math(s) has come to cure American audiences of its mathematitis! Mr. X and Mr. Y, a duo of seriously screwy professors, rigorously explain to you their erudite theories on zero, infinity, PVC pipes and the importance of the zebra in numeration. Created by Kevin Lapin and Olivier Faliez in the summer of 2003, “Mad Maths” was first produced and performed by the company Sous un autre Angle in France, where it continues to tour schools, festivals and theaters. To date it has been performed over 500 times across France, Belgium and Switzerland. It has toured to Asia, Mexico, Chicago and the Lycée Français of New York. The show has received the accreditation of the Paris educational authority as well as the support of the Créteil and Versailles school districts. In December of 2003, an excerpt of “Mad Maths” was performed as part of the Grand Mezze with Edouard Baer and François Rollin at the Théâtre du Rond Point in Paris. In March of 2004, the show received a grant from the Regional Directorate of Research and Technologies (DRRT – Ile de France). 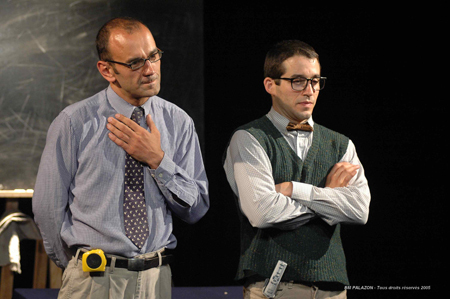 In 2004, while continuing to perform in schools across France, “Mad Maths” began a theatrical career as well, playing to sold out audiences at the Festival d’Avignon Off in both 2004 and 2005. 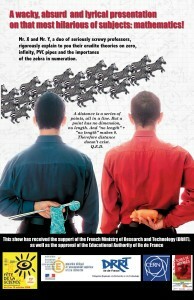 In October of 2004, the show was intensively programmed at the Musée des Arts et Métiers and the Palais de la Découverte in Paris and simultaneously at the University of Rouen during the National Science Week, at this time the company Sous un autre Angle was also accorded a grant by the organizing structure. In November of the same year, Kevin and Olivier traveled to the southern hemisphere, while still remaining on French territory, to perform “Mad Maths” on the beautiful Reunion Island. They were invited to return again in 2007 after Gaëton Peau had taken over the role of Monsieur X from Kevin who had repatriated to his native United States. In November of 2004, “Mad Maths” was received for a week of performances at the Théâtre des Bains Douche in Le Havre. And from March to May of 2005, it performed 4 nights a week at the Théâtre du Funambule in Paris. In the fall of the same year, Mr. X and Mr. Y once again participated intensively in the National Science Week, before taking part in the bi-annual science and theater festival, the Scènes de Méninges in Saint Etienne. In 2006, “Mad Maths” was invited to perform in the new Globe building of the world’s largest particle physics laboratory, the CERN in Geneva, Switzerland. Later that year, Kevin returned to the United States and the show continued with his replacement. Return to math… To create a play about math means to a certain extent creating a mathematical play, which is to say a play that is scientifically precise. So we started with a good dose of research and review, hitting the books to be sure that everything we said would be mathematically accurate. This also helped us remember what it was like to be students again. Evoking the subject of math, equates to evoking memories, sometimes good but more often bad, of high-school math classes. Though one of our goals was to show people that math isn’t just a subject that you are forced to take in school, these tedious—even tortuous—memories are ultimately and unavoidably what we all have in common with math, and therefore the perfect starting place for the play. The trick would then be to bring the audience back to this familiar territory and then quickly (before the traumatic flashbacks set in) whisk them away to new and unexpected mathematical terrain. So our play would be set up like a class or lecture, but how to surprise you with math’s hidden treasures of mystery, absurdity and humor? Stick with math… Big words and ideas for a silly little play about math, right? But that’s it, math is hard. It demands a certain rigor and precision, and the temptation, for us as much as any student, is to avoid the issues, skirt around the topics and never get beyond the obvious parodies of math nerds (not that Mr. X and Mr. Y don’t wear glasses and enjoy a good round of triple- integration now and again!). “Mad Math” would also not be about finding real world applications of math, though laudable and even interesting, we wanted to stay close to the theoretical and occult aspects of the science. A television screen or field trip are better suited vehicles for discovering the wonders and math behind s kyscrapers and pyramids. The stage and theater are just the place to find the magic and poetry in math, what’s hidden on the inside, or behind, that complicated formula. One has to look back on the time when math, science and meta-physics were all considered to be aspects of the same thing, the study of the meaning and the inner workings of life. These were truly religious questions, questions of life and death. Now those are dramatic stakes. Talk math… How then to truly talk about math without losing either the theater or our audience? If we start by going back in time and understanding man (and woman’s) desperate need for reliable systems of -counting, measuring and calculating we’ve already begun to humanize the subject. Now if we imagine how the world would be different if we used different math to describe it, we are involved in a creative process. Finally, if we push these ideas to the extreme, turn them on their head and even transpose them a little, things will really get interesting. Where the theories and concepts touch on the absurd, where there are ambiguities, that’s where there the humor, humanity and, yes, even poetry is to be found in math… Suddenly, we find ourselves on familiar territory again, not that of the fastidious algebra lesson, but that of language, describing the world around us and- trying to understand why it’s the way it is and our place in it, questions which are at once essentially the territory of theater and mathematics. QED. Visit the French website at www.madmaths.fr. "Appreciate beauty in all its forms." | © 2019 Kevin Lapin | "Get stuck in there!"